LENGTH: 2 miles of walking trails. 22 miles of equestrian trails. COMMENTS: No cell signal for Verizon or AT&T. No WIFI for campers. Hard Labor Creek is a Georgia State Park and best known for its golf course. It does have a small beach area, two lakes and trails for hiking and horseback riders. 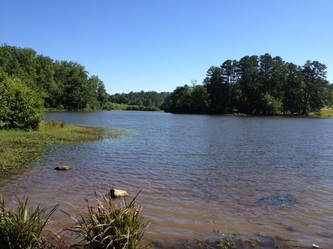 The park's name may have come from slaves who tilled summer fields or American Indians who found the creek difficult to cross. Hard Labor Creek was once eroded cotton and corn fields and known as Hard Labor Creek National Recreation Demonstration Area. The Civilian Conservation Corpsland stabilization was one of the first projects accomplished in the 1930s. The Creek Golf Course has a pro shop, driving range, rental carts and special rates for seniors and children. This is an 18-hole course and has been called "the hardest starting hole in Georgia." 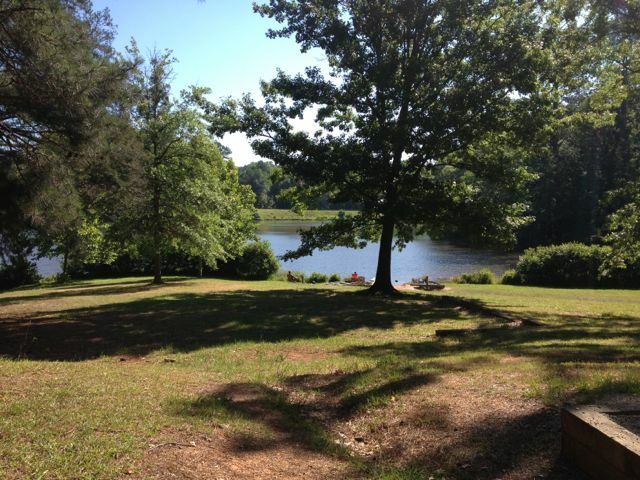 There are 20 cottages, 2 group shelters and 46 tent, trailer or RV campsites. We camped here in June, 2012 and the water level was so low we couldn't see water from our site. Click here to view our camping page, RV Home on the Road. We enjoyed riding our bikes through the park and hiking the 2 miles of walking trails. 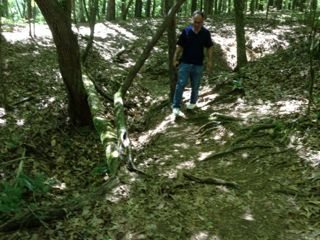 The trail is mostly easy but I added moderate due to the rocks and a few steep hills. 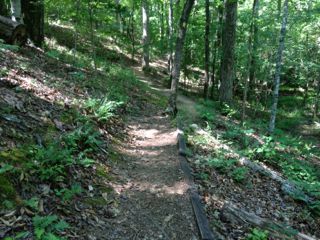 We hiked the one-mile Brantley Nature Trail through a forest of beautiful hard woods. 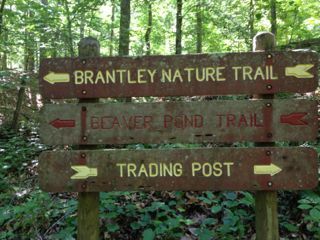 The Beaver Pond Trail splits off of the Brantley Trail and is marked in red. The Beaver Pond still shows scars from the early agricultrual period of this forest. 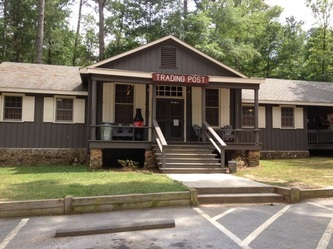 DIRECTIONS FROM ATLANTA: 2 miles north of Rutledge, GA. Take I-20 exit #105 into Rutledge and travel 3 miles on Fairplay Road. The park is between Madison and Covington.